As we celebrate Remembrance Day on November 11 I thought it would be appropriate that Sunbonnet Sue wear a poppy. 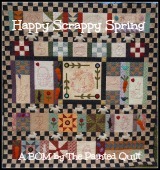 I have always liked Sunbonnet Sue and when I came across an old 2005 Patchwork Quilting magazine with a pattern for a years worth of Sunbonnet Sue I found a new project. Sunbonnet Sue dates from early 1900 and were first illustrations in a children's story book. I think I am going to have fun with Sue. My intention is to work from scraps and to complete a few of these each week. How appropriate of Sunbonnet Sue! Your new project will keep you plenty busy!